Engine: 1203cc air cooled 4 valve vee twin. Dry sump. Electronic fuel injection. Frame: Extruded aluminium perimeter frame containing with vibration damping. Showa fully adjustable suspension front and rear. Rear: 245mm disc with single piston caliper. 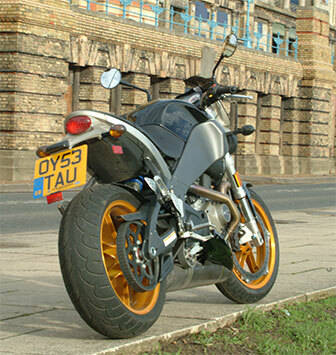 Zero Torsional Load and it refers to the way the brake disc is mounted. On most bikes, the disc is on the hub so when it slows the bike there is a huge load transmitted through the wheel spokes to the rim and the tyre. 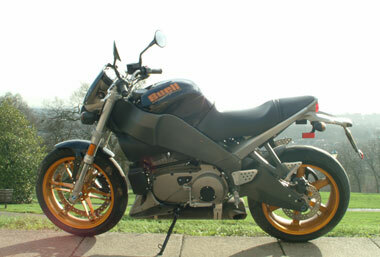 Buell mount the disc directly on the rim. This does away with the need for big strong spokes to handle that load and so makes the wheel lighter, reducing unsprung weight and making it easier to turn. A side effect is that the brake produces so much stopping power that only one disc is needed so unsprung weight is reduced even further. 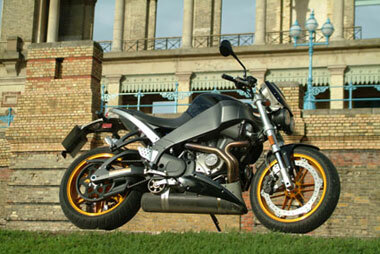 Some people reckon that the big brake disc acts like a gyroscope and makes the Buell harder to turn. The first thing you will notice about the Lightning is that it is physically tiny. I know I’ve mentioned it before, but it bears repeating. 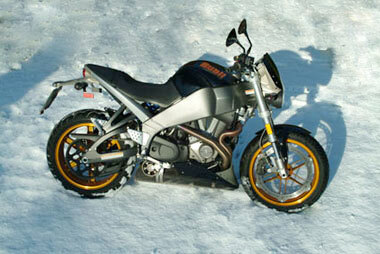 This is not a big bike. And it feels small when you’re on board, although the engine is tall enough to prevent any risk of getting cramped. It feels very well screwed together, and though the clocks may not be the clearest in the world the rest of the controls fall comfortably and easily to hand. Take a glance in the neat and very well positioned mirrors, turn the ignition on, wait for the fuel pump to finish and the check engine light to go out, thumb the starter and feel what 1200cc of off balance vee twin does to a very light frame. And to the rider. Marvel as the clear view of the world in those mirrors vanishes into a haze of vibration. And grin the first of many grins you enjoy as the bike reaches up inside you, goes straight to the dial marked ‘Feelgood’ and cranks it up a few notches.